The Green Zone Golf Club (also known as The Torino Golf Club) is roamed by beautiful reindeer was built & designed by Ake Persson in 1987 and is only an hour away from the Arctic Circle. This 18 hole golf course (par 72) straddles two different countries and two different time zones, with nine holes in Finland & nine holes in Sweden! The river Torino requires crossing four times via footbridges, however, be aware that there is an additional factor of time zones to navigate too, as ‘technically’ you will gain & lose time while playing your round of golf! The Signature Hole which is on the 6th hole and it is a par 3 of approximately 132 yards with two very deep bunkers of either side of the green. 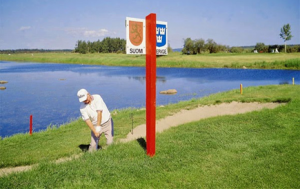 When you tee-off in Sweden you have the opportunity to do the most memorable and longest ‘Hole in One’ in the world, and if the flag pin is positioned in its trickiest place, your ball will reach the putting green in Finland 1 hour later. On the 7th Par 4 hole at 325m, your tee shot will have to be ‘up the middle’ of the fairway as you have a large body of water on both sides to trap a wayward shot but this expanse of water is a big feature on most of the holes on this golf course. Due to the golf clubs unique location, it is possible to play golf at any time of the day or night in full sunshine during the summer, all due to the midnight sun which does not go down for months. 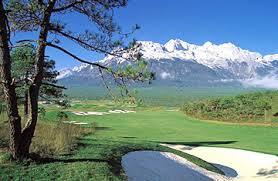 However, you can still play golf on this beautiful golf course in the winter but it will be on snow. The Golf Club also hold the ‘Midnight Sun 90 hole’ Golf Event that is several days & nights of non-stop golf each year in late June & July. I think this golf club is well and truly one of the unique golf courses of the world!